Selected in the fourth round (27th overall) of the 2012 CFL draft and signed on Jan. 8, 2014. 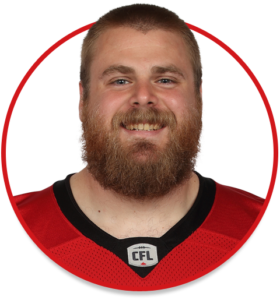 (Calgary) Erdos started all 18 regular-season games at right guard and was part of an offensive line that was tied for the fewest sacks allowed in the CFL this season with 27. He was also a starter for both the Western Final and the Grey Cup. (Calgary) Erdos started 18 games at right guard. He recorded three tackles. He also started the Western Final and the Grey Cup. (Calgary) Erdos played 11 games including nine starts at right guard. He also started the Western Final at right guard. (Calgary) Erdos played 11 games, including eight starts at right guard. He was placed on the one-game injury list before Game 12 and the six-game injury list before Game 13. (Calgary) Erdos dressed for three games, playing his first CFL game on Sept. 21 in Montreal and also dressing for the final two regular season games. He spent the rest of the season on the practice roster. Erdos joined Simon Fraser in 2009 when the Burnaby, B.C., school was part of the CIS and played three more seasons after the Clan made the switch to the NCAA in 2010. In 2013, he started all 10 games at left tackle for Simon Fraser and was part of a unit that allowed the second-fewest sacks in the Great Northwest Athletic Conference. He missed the 2012 season with an Achilles injury. Erdos was born in Lethbridge and raised in nearby Coaldale. He attended Catholic Central High School in Lethbridge.